vintage pyrex! i don't have a single piece and i think that needs to change. it is so pretty and so much fun and so not tupperware (although they don't come with tops so i am thinking that might not be a fair comparison). anyway what do you think? Such a bummer that they don't come with tops. I almost love them but the boy would never forgive me if I started bringing home more 'granny stuff'! There are actually some pyrex pieces with lids. I have a few of the fridge containers. Albeit the lids are glass and certainly not airtight they look amazing all together on fridge shelf. As someone who already has a pretty good vintage Pyrex collection going, I say go for it, tops or no. Especially for something like mixing bowls, which rarely have tops anyway. They will make your kitchen so cheery. 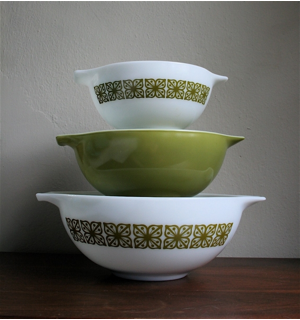 Also--you probably already know this but you can find tons of vintage Pyrex, and even several with tops, on Etsy.